Æthelwold ou Ethelwold de Wessex, finado o 13 de decembro do 902, era o menor dos dous fillos de Aethelred I, rei de Wessex de 865 a 871. Aethelred morreu polas feridas sufridas en batalla contra os viquingos, contra os que loitou gran parte da súa vida. Como os seus fillos eran demasiados novos para subir ao trono no momento da súa morte, Aethelred foi sucedido polo seu irmán pequeno, Alfredo o Grande. Case trinta anos máis tarde, cando morreu Alfredo o 899, Aethelwold quixo disputar o trono ao fillo de Alfredo, Eduardo o Vello, e tentou levantar un exército pero incapaz de atopar apoio nas terras de Wessex, viuse obrigado a fuxir a Northumbria, territorio controlado polos viquingos. Alí foi aceptado como rei e puido reunir unha frota coa cal partiu rumbo ao Reino de Anglia Oriental, que estaba baixo control danés. En 902 xa convencera aos daneses da rexión para atacar Wessex enfrontándose ás tropas de Eduardo. Durante a Batalla do Holme, o 13 de decembro do 902, os daneses derrotaron ás tropas de Kent aliadas de Eduardo, pero sufriron moitísimas baixas, Aethelwold entre elas. No século VIII, Mercia era o reino máis poderoso do sur de Inglaterra, pero durante o reinado de Ecgberht, xa no século IX, Wessex pasou a ser o reino máis forte. Ecgberht e o seu fillo Aethelwulf, viron os inicios da invasión viquinga, pero puideron resistir os ataques con éxito. Aethelwulf morreu en 858 e foi sucedido por catro dos seus fillos nun intervalo de tempo bastante curto. O pai de Aethelwulf, Aethelred I, subiu ao trono o mesmo ano que o Gran exército pagán invadiu Inglaterra. En menos de cinco anos os viquingos conquistaran Northumbria e Anglia Oriental, obrigando a Mercia a lles pagar tributo. En 871, xa en campaña para conquistar Wessex, enfrontáronse a Aethelred e o seu irmán Alfredo en catro batallas en poucos meses. Nas dúas últimas os saxóns foron derrotados e o rei Aethelred, morto. En 878 os viquingos dominaban case a totalidade de Wessex e Alfredo atopábase atrapado nos humidais de Somerset, pero sorprendentemente foi quen de contraatacar e gañar a crucial Batalla de Ethandun. En 880 asinaba un tratado de paz con Guthrum I de Anglia Oriental, establecendo a fronteira entre os reinos ingleses de Wessex e Mercia dun lado e os territorios do Danelaw doutro. Sábese pouco da familia de Aethelwold. A súa nai foi probabelmente Wulfrida de Wessex. O seu irmán maior Æthelhelm só aparece no testamento de Alfredo de 880, e probabelmente morreu pouco despois. Quizais tivo outro irmán de nome Osweald do que pouco se sabe. Aethelred e Alfredo tiñan un acordo polo cal se deixaban mutuamente todas as súas propiedades en caso de morrer, feito que, á morte de Aethelred, deixou a Aethelwold e aos seus irmáns sen bens. Cando Alfredo morreu, Eduardo herdou o reino, mentres que Æthelhelm herdaba oito condados e Aethelwold só tres. Alfredo sempre deu prioridade ao seu fillo, dándolle a oportunidade de liderar tropas en batalla, mentres Aethelwold pasaba a un segundo plano, feito que seguramente motivou os seus ánimos de desquite e revolta á morte de Alfred. Á morte de Alfredo en 899, Aethelwold considerou que tiña fortes argumentos para reclamar o trono, pois era o príncipe de maior rango entre os posíbeis sucesores, así que reuniu as súas tropas e secuestrou a unha monxa dun convento con quen casou sen o consentimento de Eduardo. A identidade desta monxa non é coñecida, pero tiña que ser importante para reforzar a lexitimidade da revolta de Aethelwold. A pesar de todo, foi incapaz de reunir bastante seguidores, e cando Eduard saíu ao seu encontro, Aethelwold deixou atrás á súa recente esposa e fuxiu a Northumbria. Segundo a Crónica anglosaxoa, alí foi aceptado como rei. En 901 partía cunha frota de Essex e en 902, coa axuda dos daneses de Anglia Oriental, atacaron Wessex e Mercia. En resposta, Eduardo atacou as terras do sur de Danelaw e cando se retiraba, os seus aliados de Kent topáronse cos daneses na Batalla do Holme, o 13 de decembro. Segundo a crónica, os daneses resultaron vitoriosos, xa que retiveron o control do campo de batalla, pero sufriron numerosas baixas. Entre os mortos contáronse Aethelwold e o rei dos viquingos, Eohric de Anglia Oriental. "Æthelwald 35 (Male) Ætheling, cousin of Edward 2, d.902". Prosopography of Anglo-Saxon England (PASE). Arquivado dende o orixinal o 4 January 2014. Consultado o 5 May 2014. Abels, Richard (1988). Lordship and Military Obligation in Anglo-Saxon England. Berkeley, USA: University of California Press. ISBN 0-520-05794-5. Abels, Richard (2002). "Royal Succession and the Growth of Political Stability in Ninth-Century Wessex". The Haskins Society Journal: Studies in Medieval History (Boydell & Brewer) 12. ISBN 1-84383-008-6. Campbell, James (2001). "What is Not Known about the reign of Edward the Elder". En Higham, N. J.; Hill, D. H. Edward the Elder 899–924. Abingdon, UK: Routledge. ISBN 0-415-21497-1. Dumville, David (1979). "The ætheling: a study in Anglo-Saxon constitutional history". Anglo-Saxon England (Cambridge University Press) (8). ISSN 0263-6751. Dumville, David (1992). Wessex and England from Alfred to Edgar. Woodbridge, UK: The Boydell Press. ISBN 0-85115-308-9. Edwards, Heather (2004). "Ecgberht [Egbert] (d. 839), king of the West Saxons". Oxford Dictionary of National Biography. Oxford University Press. doi:10.1093/ref:odnb/8581. Consultado o 16 October 2013. Hart, Cyril (1992). 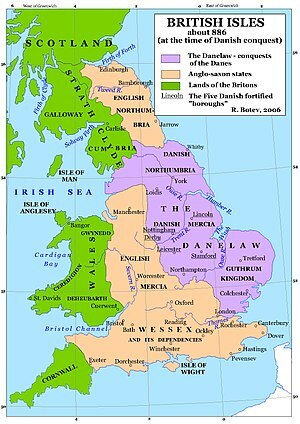 The Danelaw. London, UK: The Hambledon Press. ISBN 1-85285-044-2. Higham, Nick (2001). "Edward the Elder's reputation". En Higham, N. J.; Hill, D. H. Edward the Elder 899–924. Abingdon, UK: Routledge. ISBN 0-415-21497-1. Jayakumar, Shashi (2008). "Eadwig and Edgar: Politics, Propaganda, Faction". En Scragg, Donald. Edgar, King of the English, 959–975. Woodbridge, UK: The Boydell Press. ISBN 978-1-84383-928-6. Keynes, Simon; Lapidge, Michael, eds. (1983). Alfred the Great: Asser's Life of King Alfred and Other Contemporary Sources. London, UK: Penguin Classics. ISBN 978-0-14-044409-4. Kirby, D. P. (2000). The Earliest English Kings (Revised ed.). London, UK: Routledge. ISBN 0-415-24211-8. Lavelle, Ryan (2009). "The Politics of Rebellion: The Ætheling Æthelwold and the West Saxon Royal Succession, 899–902". En Skinner, Patricia. Challenging the Boundaries of Medieval History: The Legacy of Timothy Reuter. Turnhout, Belgium: Brepols. ISBN 978-2-503-52359-0. Mason, Emma (2004). "Æthelnoth (d. 1038), Archbishop of Canterbury". Oxford Dictionary of National Biography. Oxford University Press. doi:10.1093/ref:odnb/8912. Consultado o 5 May 2014. Miller, Sean (2004a). "Æthelred I [Ethelred I] (d. 871), King of the West Saxons". Oxford Dictionary of National Biography. Oxford University Press. doi:10.1093/ref:odnb/8913. Consultado o 24 March 2014. Miller, Sean (2004b). "Edward (called Edward the Elder) (870s?–924), King of the Anglo-Saxons". Oxford Dictionary of National Biography. Oxford University Press. doi:10.1093/ref:odnb/8514. Consultado o 16 July 2012. Nelson, Janet L. (1986). "'A King Across the Sea: Alfred in Continental Perspective". Transactions of the Royal Historical Society. 5th (Cambridge University Press) 36. ISSN 0080-4401. JSTOR 3679059. Nelson, Janet L. (2004). "Æthelwulf (d. 858), King of the West Saxons". Oxford Dictionary of National Biography. Oxford University Press. doi:10.1093/ref:odnb/8921. Consultado o 16 October 2013. Nelson, Janet (2008). "The First Use of the Second Anglo-Saxon Ordo". En Barrow, Julia; Wareham, Andrew. Myth, Rulership, Church and Charters. Aldershot, UK: Ashgate. ISBN 978-0-7546-5120-8. Rollason, David (2003). Northumbria 500–1100: Creation and Destruction of a Kingdom. Cambridge, UK: Cambridge University Press. ISBN 0-521-81335-2. Ryan, Martin J. (2013). "Conquest, Reform and the Making of England". En Higham, Nicholas J.; Ryan, Martin J. The Anglo-Saxon World. New Haven, USA: Yale University Press. ISBN 978-0-300-12534-4. "S 356". The Electronic Sawyer: Online Catalogue of Anglo-Saxon Charters. Consultado o 10 June 2014. Smith, Scott Thompson (2012). Land and Book: Literature and Land Tenure in Anglo-Saxon England. Toronto, Canada: University of Toronto Press. ISBN 978-1-4426-4486-1. Smyth, Alfred P. (1987). Scandinavian York and Dublin 1. Dublin, Ireland: Irish Academic Press. ISBN 0-7165-2365-5. Smyth, Alfred P. (1995). King Alfred the Great. Oxford, UK: Oxford University Press. ISBN 0-19-822989-5. Stafford, Pauline (2008). "'The Annals of Æthelflæd': Annals, History and Politics in Early Tenth-Century England". En Barrow, Julia; Wareham, Andrew. Myth, Rulership, Church and Charters. Aldershot, UK: Ashgate. ISBN 978-0-7546-5120-8. Stenton, Frank M. (1971). Anglo-Saxon England (3rd ed.). Oxford, UK: Oxford University Press. ISBN 978-0-19-280139-5. Thacker, Alan (2001). "Dynastic Monasteries and Family Cults: Edward the Elder's Sainted Kindred". En Higham, N. J.; Hill, D. H. Edward the Elder 899–924. Abingdon, UK: Routledge. ISBN 0-415-21497-1. Williams, Ann (1979). Brown, R. Allen, ed. "Some Notes and Considerations on Problems Connected with the English Royal Succession 860–1066". Proceedings of the Battle Conference on Anglo-Norman Studies (The Boydell Press). ISBN 0-85115-107-8. Williams, Ann (1991a). "Æthelwold Ætheling d. 903". En Williams, Ann; Smyth, Alfred P.; Kirby, D. P. A Biographical Dictionary of Dark Age Britain. London, UK: Seaby. p. 33. ISBN 978-1-85264-047-7. Williams, Ann (1991b). "Burgred King of Mercia 852–874". En Williams, Ann; Smyth, Alfred P.; Kirby, D. P. A Biographical Dictionary of Dark Age Britain. London, UK: Seaby. pp. 68–69. ISBN 978-1-85264-047-7. Woolf, Alex (2001). "View from the West: An Irish Perspective". En Higham, N. J.; Hill, D. H. Edward the Elder 899–924. Abingdon, UK: Routledge. ISBN 0-415-21497-1. Wormald, Patrick (2001). "Kingship and Royal Property from Æthelwulf to Edward the Elder". En Higham, N. J.; Hill, D. H. Edward the Elder 899–924. Abingdon, UK: Routledge. ISBN 0-415-21497-1. Yorke, Barbara (1988). "Æthelwold and the Politics of the Tenth Century". En Yorke, Barbara. Bishop Æthelwold: His Career and Influence. Woodbridge, UK: The Boydell Press. ISBN 978-0-85115-705-4. Yorke, Barbara (1995). Wessex in the Early Middle Ages. London, UK: Leicester University Press. ISBN 0 7185 1856 X.
Yorke, Barbara (2001). "Edward as Ætheling". En Higham, N. J.; Hill, D. H. Edward the Elder 899–924. Abingdon, UK: Routledge. ISBN 0-415-21497-1. A última edición desta páxina foi o 3 de abril de 2019 ás 17:23.